Thanks to our location in calm surroundings, and with a tram stop right outside our door, Scandic Kokstad is perfect for those who wish to combine nature and city life. Our free parking facilities make it easy to leave your car. We are only 35 minutes by tram from Bergen city centre, and close to fun family activities at Flesland. Our newly refurbished facilities offer exciting food and beverage experiences, as well as activities that suit all types of gatherings. In our hotel you can enjoy a well-equipped gym, playroom, climbing wall and zip-line for the youngest, as well as a great selection of games, including shuffleboard and billiards. In addition, we have 32 long-term stay rooms on the 2nd floor, with a common area, terrace and self-service laundry facilities – a great offer for those who work project-based or are commuters. At our hotel you can stay comfortably for a longer period in our long-term stay rooms – you can hold creative work meetings, or gather friends and family for socialising and good dining experiences. Welcome to our new Scandic Kokstad. A new meeting place in the south of Bergen – where nature and city meets. Enjoy a delicious meal in one of our restaurants. Try our modern restaurant, or pop by our hotel bar with its art deco design. 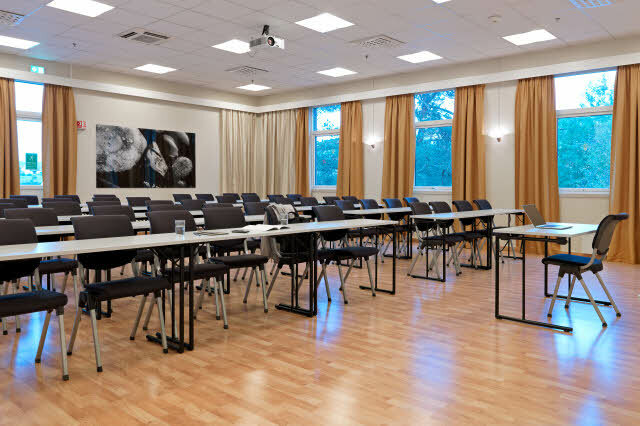 Our conference department has 11 bright and modern meeting rooms with a capacity for up to 280 people.